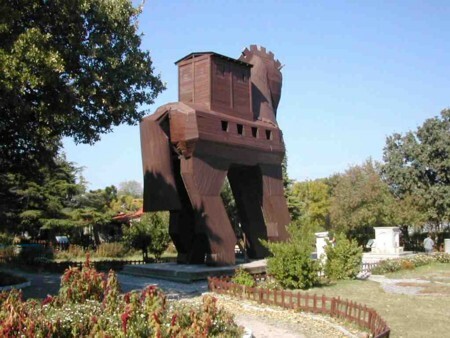 Troy is famous, because of the Trojan war, which, according to Homer's Iliad, took place in the 13th century B.C.. Troy was long considered a myth until it was discovered in 1871 by the amateur archeologist and treasure hunter Heinrich Schliemann. Most archeologists believe the place near the Dardanelles (present-day Turkey) is the city mentioned in Homer's famous work. The horse figure from "Troy" stands 38 feet high and weighs 11 tons and was fashioned from steel and fiberglass designed to look like wood recycled from the hulls of ships, which was likely the only building material available to the Greeks.